NIMBioS organizes and hosts an annual Undergraduate Research Conference at the Interface of Biology and Mathematics each fall. Student talks and posters are featured as well as panel discussions. Faculty and Minority Serving Institution partners and high school teachers are invited to see the research of these undergraduates. Conferences are held at the University of Tennessee Conference Center in Knoxville. Keynote Speaker: Holly Gaff, Biological Sciences, Old Dominion Univ. Plenary Speaker: Kiona Ogle, The School of Informatics, Computing, and Cyber Systems, Northern Arizona Univ. 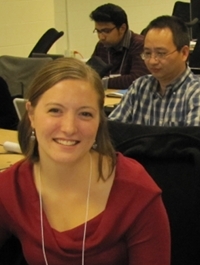 Featured speaker: Rachel Lenhart, University of Wisconsin, Madison.